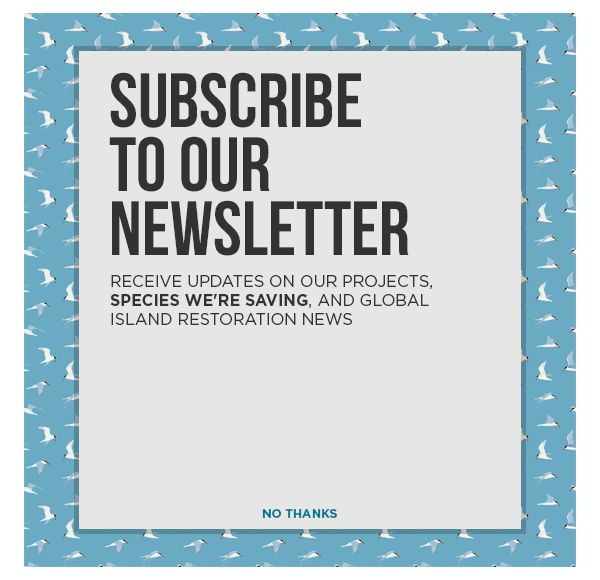 Island Conservation’s Restoration Specialist and Wildlife Veterinarian Paula Castaño shares how removal of invasive rodents and feral cats will pave the way for native species reintroduction on Floreana Island. Floreana Island is located in one of the most amazing places on earth: the Galápagos Islands. Floreana is known for being the first island of the archipelago to be colonized and for having a mysterious human history. Floreana is a paradise on its own; here a small human community of around 140 people lives pleasantly without the hassle you may find in big cities or other inhabited islands in the archipelago. This small community of people, who called themselves “Floreanenses” are proud to live on their island and share their daily life as farmers, teachers, park guards and so forth with nature. The island is home to many unique species, some endemic to the island, such as the Medium Tree Finch, and others endemic to the archipelago, such as the Galápagos Petrel, whose largest colony breeds on Floreana. Unfortunately, as is the case on many other islands around the world and even here in the archipelago, native and endemic fauna are not alone in paradise. Invasive mammals such as the House Mouse, the Black Rat, and feral cats, in addition to other invasive species, such as the Philornis fly (Philornis downsi) are also present on the island. These species were introduced by people at different stages in the island’s human history and became invasive, negatively impacting wildlife populations and island food security. The impacts of these invasive species can be measured by reviewing data from the International Union for the Conservation of Nature (IUCN) Red List. Currently 55 Floreana species are listed as threatened, with at least two of these species being classified as Critically Endangered, which suggests high likelihood of extinction within our lifetime. A total of 13 species have been extirpated from the island including the iconic Floreana Mockingbird—meaning they are not extinct but they are not found there anymore. The Floreana Mockingbird is endemic to Floreana and its offshore islets—it’s found nowhere else on Earth. The rare bird is listed as Critically Endangered on the IUCN Red List and experts believe it was extirpated from the island by invasive rodents and feral cats. A small population of the species remains on two small islets, Champion and Gardner-by-Floreana, located in the northeast side of Floreana Island where invasive rodents and feral cats are not present. People often ask how invasive species have such a high impact on native and endemic wildlife of Floreana—invasive species are present on other islands of the Galápagos, yet the destruction on Floreana is significantly more pronounced. One theory is that Floreana species did not evolve with any tools or strategies to cope with rodent predation, because Floreana, unlike other islands in the archipelago, never had any native rodents. Once an invasive rat or mouse comes along, Floreana’s native species are defenseless. However, there is hope. Fortunately, the remaining native species of Floreana, and the people of the community who work hard every day to protect them are not alone in the quest to remove invasive species. The Galápagos National Park Directorate and Island Conservation are working hard to protect Floreana’s native species. The Galapagos Conservancy has supported Island Conservation’s Galapagos restoration efforts since 2012, helping us to fill critical knowledge gaps to advance our conservation activities and achieve our goal to restore Floreana Island.The Floreana Restoration Project’s main goal is to restore the island by removing invasive rodents and feral cats, so that in the near future, some, if not all the extirpated species, can return to Floreana. Once invasive rodents and feral cats are removed, native species such as the Floreana Mockingbird, Floreana Giant Tortoise, Vermilion Flycatcher, and others can be reintroduced, and species currently present, like the Galápagos Petrel, can continue to thrive. This endeavor will give Floreana Island the opportunity to recover, which in turn benefit the Floreana community. Because of this project, I have hope for the iconic species of this unique place—this place that I like to call “Paradise” and has become my second home.